This is Part 2 of a two-part article on Asian-owned small businesses in America. Part 1 examined the industry distribution and annual sales of Asian businesses in 2011. This part discusses the regional location of Asian businesses and examines their employment and years of operation. The information was generated by the Gazelle Index, which was created to close the information gap on minority-owned businesses. The Gazelle Index is the first ever national quarterly survey of the outlook and hiring plans of minority, women and non-minority small-business owners. The responses of business owners were broken down by blacks, Latinos, women and non-minorities. Future surveys include Asian Americans. This examination is based on Asian small businesses with 10 to 100 employees. It is taken from a random sample of 277 companies. The Census Bureau’s survey of minority-owned businesses indicated that between 1982 — 2007, the number of Asian-owned businesses increased by 545%, from 241,806 to 1.6 million. The industry having the highest concentration of Asian businesses was food, entertainment and hospitality services, which contained of 27.4% of all Asian businesses. This was followed by wholesale trades, 13.4%; manufacturing, 11.9%; retail trades 8.7%; finance, insurance and real estate, 5.4%; professional and technical services, 5.1%; the and information services 5.1%; business services, 5.1%. The average revenue of Asian-owned businesses was $3.6 million in 2011. Retail trades had the largest annual revenue, $11.6 million; followed by wholesale trades, $8.4 million; finance, insurance and real estate, $5.1 million; and manufacturing, $4.1 million. The industry with the lowest annual revenue was food, entertainment and hospitality services, $622,159. The largest number of Asian owned businesses is located in the West. That region accounted for 46.5% of Asian enterprises. Their average revenue was $3.6 million in 2011. The second-largest regional location is the Northeast, where 25.1% of businesses are headquartered. However, businesses in the Northeast had the highest annual revenue, $4.7 million. The third largest region in terms of the number of Asian owned businesses is the South, where 18.1% is located and where the average revenue is $2.8 million. The Midwest had the smallest number of Asian owned businesses (10.3%) and those businesses earned the lowest revenue, $1.7 million annually. 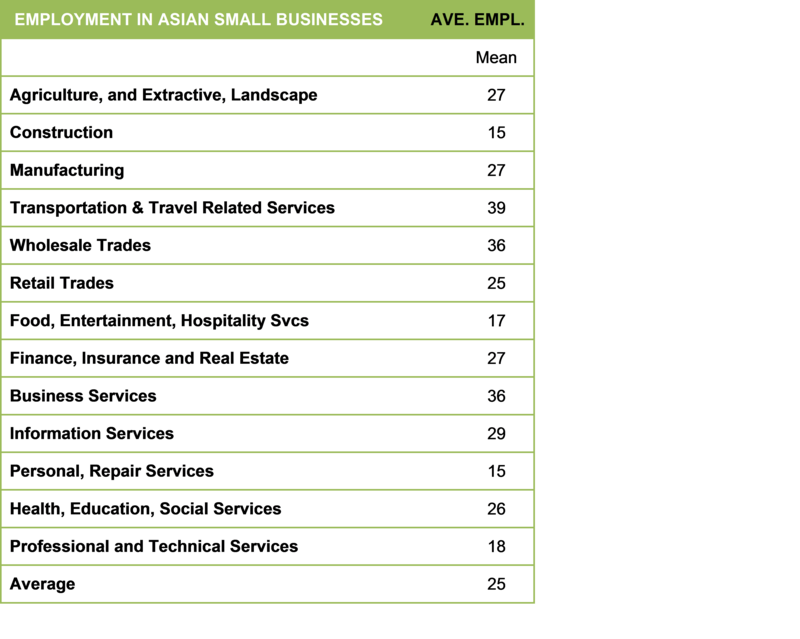 The average employment in Asian businesses was 25 workers. Keep in mind that our sample included businesses with 10 to 100 employees. Generally, there was not a wide variation in the average employment across industries. Businesses in transportation and related travel services had the largest number of employees 39. In descending order of employment size, other industries were as follows: business services, 36; wholesale trades, 36; information services, 29; agriculture and landscape services, 27; manufacturing, 27; finance, insurance and real estate, 27; and health, education and social services, 26. The industry with businesses that had the smallest level of employment was professional and technical services, 18; food, entertainment and hospitality, 17; and personal and repair services, 15. The industry within which businesses have operated the longest was agriculture and landscape services. In that industry, the average businesses started in 1982. 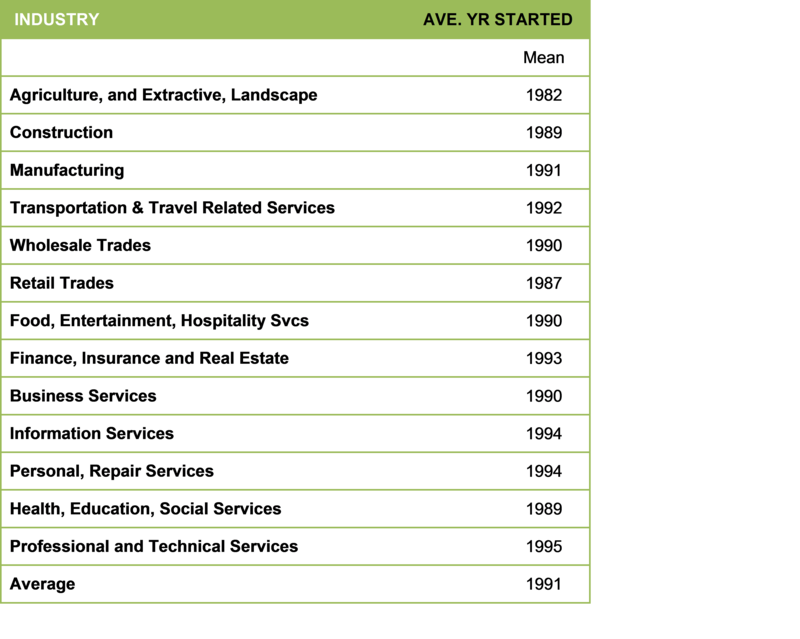 The startup year for business is in construction services and in health, education and social services was 1989. Overall, the average Asian business and began operating in 1991.